Bishop of Geneva, Doctor of the Universal Church; born at Thorens, in the Duchy of Savoy, August 21, 1567; died at Lyons December 28, 1622. His father, François de Sales de Boisy, and his mother, Françoise de Sionnaz, belonged to old Savoyard aristocratic families. The future saint was the eldest of six brothers. His father intended him for the magistracy and sent him at an early age to the colleges of La Roche and Annecy. From 1583 till 1588 he studied rhetoric and humanities at the college of Clermont, Paris, under the care of the Jesuits. While there he began a course of theology. After a terrible and prolonged temptation to despair, caused by the discussions of the theologians of the day on the question of predestination, from which he was suddenly freed as he knelt before a miraculous image of Our Lady at St. Etienne-des-Grès, he made a vow of chastity and consecrated himself to the Blessed Virgin Mary. In 1588 he studied law at Padua, where the Jesuit Father Possevin was his spiritual director. He received his diploma of doctorate from the famous Pancirola in 1592. Having been admitted as a lawyer before the senate of Chambéry, he was about to be appointed senator. His father had selected one of the noblest heiresses of Savoy to be the partner of his future life, but Francis declared his intention of embracing the ecclesiastical life. A sharp struggle ensued. His father would not consent to see his expectations thwarted. Then Claude de Granier, Bishop of Geneva, obtained for Francis, on his own initiative, the position of Provost of the Chapter of Geneva, a post in the patronage of the pope. It was the highest office in the diocese, M. de Boisy yielded and Francis received Holy Orders (1593). From the time of the Reformation the seat of the Bishopric of Geneva had been fixed at Annecy. There with apostolic zeal, the new provost devoted himself to preaching, hearing confessions, and the other work of his ministry. In the following year (1594) he volunteered to evangelize Le Chablais, where the Genevans had imposed the Reformed Faith, and which had just been restored to the Duchy of Savoy. He made his headquarters in the fortress of Allinges. Risking his life, he journeyed through the entire district, preaching constantly; by dint of zeal, learning, kindness and holiness he at last obtained a hearing. He then settled in Thonon, the chief town. He confuted the preachers sent by Geneva to oppose him; he converted the syndic and several prominent Calvinists. At the request of the pope, Clement VIII, he went to Geneva to interview Theodore Beza, who was called the Patriarch of the Reformation. The latter received him kindly and seemed for a while shaken, but had not the courage to take the final steps. A large part of the inhabitants of Le Chablais returned to the true fold (1597 and 1598). Claude de Granier then chose Francis as his coadjutor, in spite of his refusal, and sent him to Rome (1599). Pope Clement VIII ratified the choice; but he wished to examine the candidate personally, in presence of the Sacred College. The improvised examination was a triumph for Francis. "Drink, my son", said the Pope to him. "from your cistern, and from your living wellspring; may your waters issue forth, and may they become public fountains where the world may quench its thirst." The prophesy was to be realized. On his return from Rome the religious affairs of the territory of Gex, a dependency of France, necessitated his going to Paris. There the coadjutor formed an intimate friendship with Cardinal de Bérulle, Antoine Deshayes, secretary of Henry IV, and Henry IV himself, who wished "to make a third in this fair friendship" (être de tiers dans cette belle amitié). The king made him preach the Lent at Court, and wished to keep him in France. He urged him to continue, by his sermons and writings, to teach those souls that had to live in the world how to have confidence in God, and how to be genuinely and truly pious - graces of which he saw the great necessity. On the death of Claude de Granier, Francis was consecrated Bishop of Geneva (1602). His first step was to institute catechetical instructions for the faithful, both young and old. He made prudent regulations for the guidance of his clergy. He carefully visited the parishes scattered through the rugged mountains of his diocese. He reformed the religious communities. His goodness, patience and mildness became proverbial. He had an intense love for the poor, especially those who were of respectable family. His food was plain, his dress and his household simple. He completely dispensed with superfluities and lived with the greatest economy, in order to be able to provide more abundantly for the wants of the needy. He heard confessions, gave advice, and preached incessantly. He wrote innumerable letters (mainly letters of direction) and found time to publish the numerous works mentioned below. Together with St. Jane Frances de Chantal, he founded (1607) the Institute of the Visitation of the Blessed Virgin, for young girls and widows who, feeling themselves called to the religious life, have not sufficient strength, or lack inclination, for the corporal austerities of the great orders. His zeal extended beyond the limits of his own diocese. He delivered the Lent and Advent discourses which are still famous - those at Dijon (1604), where he first met the Baroness de Chantal; at Chambéry (1606); at Grenoble (1616, 1617, 1618), where he converted the Maréchal de Lesdiguières. During his last stay in Paris (November, 1618, to September, 1619) he had to go into the pulpit each day to satisfy the pious wishes of those who thronged to hear him. "Never", said they, "have such holy, such apostolic sermons been preached." He came into contact here with all the distinguished ecclesiastics of the day, and in particular with St. Vincent de Paul. His friends tried energetically to induce him to remain in France, offering him first the wealthy Abbey of Ste. Geneviève and then the coadjutor-bishopric of Paris, but he refused all to return to Annecy. Controversies, leaflets which the zealous missioner scattered among the inhabitants of Le Chablais in the beginning, when these people did not venture to come and hear him preach. They form a complete proof of the Catholic Faith. In the first part, the author defends the authority of the Church, and in the second and third parts, the rules of faith, which were not observed by the heretical ministers. The primacy of St. Peter is amply vindicated. An Introduction to the Devout Life, a work intended to lead "Philothea", the soul living in the world, into the paths of devotion, that is to say, of true and solid piety. Every one should strive to become pious, and "it is an error, it is even a heresy", to hold that piety is incompatible with any state of life. In the first part the author helps the soul to free itself from all inclination to, or affection for, sin; in the second, he teaches it how to be united to God by prayer and the sacraments; in the third, he exercises it in the practice of virtue; in the fourth, he strengthens it against temptation; in the fifth, he teaches it how to form its resolutions and to persevere. The Introduction, which is a masterpiece of psychology, practical morality, and common sense, was translated into nearly every language even in the lifetime of the author, and it has since gone through innumerable editions. Treatise on the Love of God, an authoritative work which reflects perfectly the mind and heart of Francis de Sales as a great genius and a great saint. It contains twelve books. The first four give us a history, or rather explain the theory, of Divine love, its birth in the soul, its growth, its perfection, and its decay and annihilation; the fifth book shows that this love is twofold - the love of complacency and the love of benevolence; the sixth and seventh treat of affective love, which is practiced in prayer; the eight and ninth deal with effective love, that is, conformity to the will of God, and submission to His good pleasure. The last three resume what has preceded and teach how to apply practically the lessons taught therein. Spiritual Conferences; familiar conversations on religious virtues addressed to the sisters of the Visitation and collected by them. We find in them that practical common sense, keenness of perception and delicacy of feeling which were characteristic of the kind-hearted and energetic Saint. Sermons; ―These are divided into two classes: those composed previously to his consecration as a bishop, and which he himself wrote out in full; and the discourses he delivered when a bishop, of which, as a rule, only outlines and synopses have been preserved. Some of the latter, however, were taken downin extenso by his hearers. Pius IX, in his Bull proclaiming him Doctor of the Church calls the Saint "The Master and Restorer of Sacred Eloquence". He is one of those who at the beginning of the seventeenth century formed the beautiful French language; he foreshadows and prepares the way for the great sacred orators about to appear. He speaks simply, naturally, and from his heart. To speak well we need only love well, was his maxim. His mind was imbued with the Holy Writings, which he comments, and explains, and applies practically with no less accuracy than grace. Letters; mostly letters of direction, in which the minister of God effaces himself and teaches the soul to listen to God, the only true director. The advice given is suited to all the circumstances and necessities of life and to all persons of good will. While trying to efface his own personality in these letters, the saint makes himself known to us and unconsciously discovers to us the treasures of his soul. A large number of very precious treatises or opuscula. There are two elements in the spiritual life: first, a struggle against our lower nature; secondly, union of our wills with God, in other words, penance and love. St. Francis de Sales looks chiefly to love. Not that he neglects penance, which is absolutely necessary, but he wishes it to be practiced from a motive of love. He requires mortification of the senses, but he relies first on mortification of the mind, the will, and the heart. This interior mortification he requires to be unceasing and always accompanied by love. The end to be realized is a life of loving, simple, generous, and constant fidelity to the will of God, which is nothing else than our present duty. The model proposed is Christ, whom we must ever keep before our eyes. "You will study His countenance, and perform your actions as He did" (Introd., 2nd part, ch. i). The practical means of arriving at this perfection are: remembrance of the presence of God, filial prayer, a right intention in all our actions, and frequent recourse to God by pious and confiding ejaculations and interior aspirations. Besides the Institute of the Visitation, which he founded, the nineteenth century has seen associations of the secular clergy and pious laymen, and several religious congregations, formed under the patronage of the holy Doctor. Among them we may mention the Missionaries of St. Francis de Sales, of Annecy; the Salesians, founded at Turin by the Venerable (Ed's note: now Saint) Don Bosco, specially devoted to the Christian and technical education of the children of the poorer classes; the Oblates of St. Francis de Sales, established at Troyes (France) by Father Brisson, who try to realize in the religious and priestly life the spirit of the holy Doctor, such as we have described it, and such as he bequeathed it to the nuns of the Visitation. 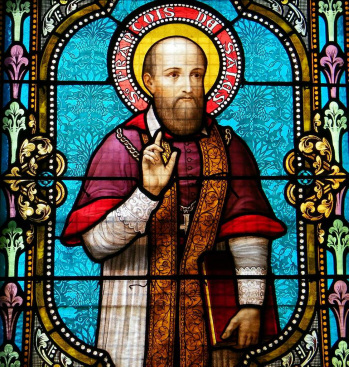 MACKEY, Oeuvres de St François de Sales (Annecy, 1892-); CHARLES-AUGUSTE DE SALES, Histoire du Bienheureux François de Sales (2nd ed., Paris, 1885); CAMUS, Esprit de S. François de Sales (2d ed., Paris, 1833); and inCollection S. Honore d'Eylau (Paris, 1904); Vie de S. François de Sales by HAMON (Paris); PÉRENNÈS (Paris); DE MARGERIE (Paris); STROWSKI, St. François de Sales (Paris); Annales Salesiennes in Revu Mensuelle (Paris, 1906, etc.). MACKEY has given an English translation of the Letters to Persons in the World, and of theLetters to Persons in Religion (London); he has also published noteworthy articles on "St. Francis de Sales as an Orator" (London) and "St. Francis de Sales as a Director" in the American Ecclesiastical Review. (1898).